Do you require a signature when packages are delivered? We will occasionally send orders Signature Required in order to protect against theft. As you might guess, it's the more expensive orders that are more likely to require a signature. There is no exact amount for requiring a signature, but it is rare we require a signature for a package worth less than $200. Almost all packages requiring a signature are FedEx shipments where we require an Indirect Signature. With an Indirect Signature anyone in the household can sign for the package. If the package can not be delivered, the driver is supposed to leave a door tag. You can either sign the door tag and have the package delivered the following day (even if no one is home), or you can pick up the package at the local FedEx facility. You just need to show them photo ID. We really do not want to inconvenience anyone by requiring a signature, and we also prefer not to get signatures because they cost us money. But because packages do occasionally get stolen, it is necessary to get signatures in certain situations. Please also keep in mind that the driver might require a signature for reasons of their own. If there have been numerous package thefts in your neighborhood a driver might require a signature, and we have no control over this. If there is damage, retain all shipping materials (including all outer and inner packaging boxes). Please re-pack the damaged product in the shipping box with the original packing material as we may put in a UPS/FedEx claim for the damages. If a product is damaged we retain the right to put in a damage claim with UPS/FedEx. UPS/FedEx retains the right to inspect any damaged merchandise, and they require that the customer retains the all shipping boxes. In many cases UPS/FedEx will not pay a claim unless the outer shipping box is damaged--and if you throw away this important evidence we can not put in a claim with UPS/FedEx and we can not replace your damaged product. Call us at Toll Free 877.878.9349 or Email sales@marineandreef.com regarding the damage and we will put in a claim with UPS/FedEx. If we need the damaged product returned either UPS/FedEx will pick up the product and return it to us or we will send you a UPS/FedEx Return Label (a pre-addressed, pre-paid shipping label). In most cases we will send out replacement products prior to when the damaged product has been returned to marineandreef.com. Orders are shipped via FedEx and the USPS (United States Postal Service). A few items, such as very large chillers (1HP and above & Red Sea Max Aquariums), are shipped via trucking companies such as Yellow Freight and R&L Carriers. Expedited orders are sent via FedEx. On business days ( business days are Monday through Friday, non-holidays), if we have the item in stock, orders are shipped within one business day. We typically will ship orders we receive before 2 PM (Arizona time) on business days on the day we receive the order. Weekend orders are usually shipped on Monday. In general, we do our best to ship as quickly as possible. Occasionally, our inventory is incorrect and we can't ship the order right away. We'll let you know as soon as possible by Email if an item you ordered is out of stock. FedEx 2Day takes two business days. Packages will be delivered to a business by 4:30 PM and to residences by 7:00 PM. We do not ship on FedEx holidays, and FedEx holidays are not business days. FedEx will not pick up or deliver packages on these days. The USPS also has the same three holidays and will not be picking up or delivering on those days. We'll have the USPS, FedEx or marineandreef.com Email you a tracking number on the evening of the day your order ships. FedEx tracking number can be checked at http://www.fedex.com/Tracking. USPS orders can be tracked at http://trkcnfrm1.smi.usps.com/PTSInternetWeb/InterLabelInquiry.do. On occasion, when we are out of stock on an item, some manufacturers will drop ship the product for us. 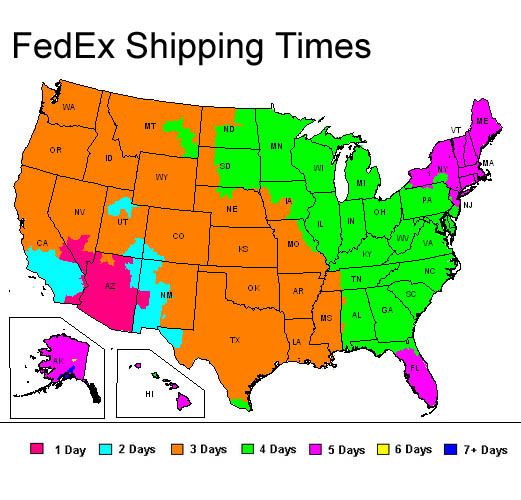 For all the products shipped from Tempe, AZ ( from where 99% of our products are shipped from) consult the FedEx Shipping map below for the exact shipping time to your area. We try and ship orders so that they'll arrive in the shortest time possible. We ship many of our smaller order via USPS Priority and First Class Mail. USPS shipments quite often takes less time to arrive than FedEx shipments. Marineandreef.com will only ship to the United States. How much is my shipping & handling? Orders under $99 to locations in the 48 contiguous states are $4.99 to ship. Orders over $99 to the 48 contiguous states are shipped for free. There are no products exempted from the free shipping offer (though we do have a Shipping Box charge for lamps 30" and longer). These options are shipped FedEx Ground, FedEx Home, UPS Ground, USPS Priority Mail, or in the case of very small items, USPS First Class. Shipping one aquarium lamp can be very expensive, and recently because of the new FedEx and UPS dimensional weight charges it has become much more expensive. A single 48" lamp can cost nearly $20 to ship. However, shipping 2, 3 or 4 really does not cost more. Instead of raising the price of the lamps (which would penalize those buying more than one lamp), we now have a Shipping Box charge as an incentive to buy more than one lamp. The charge is a single charge for the longest lamp. For example, if you purchase one 48" lamp the Shipping Box charge is $7.50. If you purchase one hundred 48" lamps and fifty 36" lamps the box charge is still $7.50. Remember, there will be a maximum of one Shipping Box charge per order. You will only be charged for the longest lamp. We also offer expedited shipping options. To get these shipping prices just put your items in the shopping cart and enter your state and zip code into the Calculate Shipping & Handling Fees boxes and choose Recalculate. More info on shipping choices, expected delivery times & order tracking..